When you go to search for a local business, what do you do first? 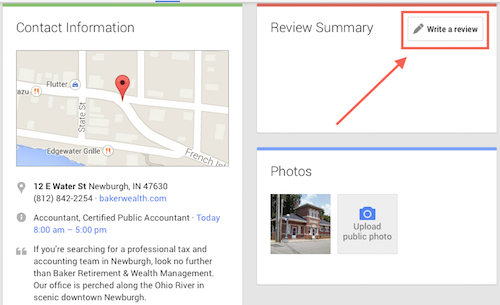 Many people (research suggests over 70%) go to Google.com and type in a keyword, such as “Newburgh, Indiana tax accountants.” The companies that show up near the top win a lot more customers than those who don’t. For local businesses like ours to get found on Google, it is absolutely vital for us to count on you, our satisfied customers, to leave helpful reviews on Google+. Do you have a Gmail email account? If so, think of Google+ as your way to leave reviews for any local business by logging into your Gmail account. Since Google owns Google+, they give preference to online reviews left through their Google+ interface. This is why it’s so important that our customers review us using Google+. How Do I Leave a Google+ Review?